As Comet C/2012 S1 (ISON) heads closer to Earth, we’re getting a better view of what has been billed by some as the “Comet of the Century.” Astronomers say these new photos from the Gemini North telescope on Mauna Kea, Hawai‘i provide hints of how well this comet might survive one of the closest comet encounters with the Sun ever recorded, on November 28, 2013. With astronomy enthusiasts hopeful and optimistic about having a spectacular comet visible in our skies, it’s anyone’s guess if the comet will actually survive its extremely close pass of the Sun to become early morning eye-candy in early December 2013. The time-sequence images, spanning early February through May 2013, show that the comet is quite active, despite how distant it is from the Sun. When Gemini obtained these images, the comet ranged between roughly 455-360 million miles (730-580 million kilometers; or 4.9-3.9 astronomical units) from the Sun, or just inside the orbital distance of Jupiter. Each image in the series, taken with the Gemini Multi-Object Spectrograph at the Gemini North telescope on Mauna Kea, Hawai‘i, shows the comet in the far red part of the optical spectrum, which emphasizes the comet’s dusty material already escaping from the nucleus. The final image in the sequence, obtained in early May, consists of three images, including data from other parts of the optical spectrum, to produce a color composite image. Gemini astronomers say the images show the comet sporting a well-defined parabolic hood in the sunward direction that tapers into a short and stubby tail pointing away from the Sun. These features form when dust and gas escape from the comet’s icy nucleus and surround that main body to form a relatively extensive atmosphere called a coma. Solar wind and radiation pressure push the coma’s material away from the Sun to form the comet’s tail, which we see here at a slight angle (thus its stubby appearance). Comet ISON will come within 800,000 miles (1.3 million km) of the Sun’s surface on November 28. Shortly before that critical passage, the comet may appear bright enough for expert observers using proper care to see it close to the Sun in daylight. Meech said that Comet ISON “…could still become spectacularly bright as it gets very close to the Sun” but also added caution. “I’d be remiss, if I didn’t add that it’s still too early to predict what’s going to happen with ISON since comets are notoriously unpredictable,” she said. Using the Gemini North Telescope, astronomers studying the central region of the Milky Way have discovered 13 diffuse interstellar bands with the longest wavelengths to date. The team’s discovery could someday solve a 90-year-old mystery about the existence of these bands. “These diffuse interstellar bands—or DIBs—have never been seen before,” says Donald Figer, director of the Center for Detectors at Rochester Institute of Technology and one of the authors of a study appearing in the journal Nature. What phenomenon are responsible for these absorption lines, and what impact do they have on our studies of our galaxy? “Observations in different Galactic sight lines indicate that the material responsible for these DIBs ‘survives’ under different physical conditions of temperature and density,” adds team member Paco Najarro (Center of Astrobiology, Madrid). Spectra of the newly discovered Diffuse Interstellar Bands (DIB's). Image Credit: Geballe, Najarro, Figer, Schlegelmilch, and de la Fuente. Since their discovery 90 years ago, diffuse interstellar bands have been a mystery. To date, the known bands that have been identified before the team’s study occur mostly in visible wavelengths. Part of the puzzle is that the observed lines don’t match the predicted lines of simple molecules and can’t be traced to a single source. “None of the diffuse interstellar bands has been convincingly identified with a specific element or molecule, and indeed their identification, individually and collectively, is one of the greatest challenges in astronomical spectroscopy, recent studies have suggested that DIB carriers are large carbon-containing molecules.” states lead author Thomas Geballe (Gemini Observatory). One other benefit the newly discovered infrared bands offer is that they can be used to better understand the diffuse interstellar medium, where thick dust and gas normally block observations in visible light. By studying the stronger emissions, scientists may gain a better understanding of their molecular origin. So far, no research teams have been able to re-create the interstellar bands in a laboratory setting, mostly due to the difficulty of reproducing temperatures and pressure conditions the gas would experience in space. There’s nothing like a dynamic solar system… and right now another planet is being heard from. According to various sources, a bright spot – possibly a developing storm – has been spotted on Uranus. Dr Sromovsky added: “The latitude of the feature is approximately 22.5° north planetocentric, which is a latitude nearly at rest with respect to the interior. So it should rotate around Uranus’ axis with nearly a 17.24-hour period. At the time of the image, the feature’s longitude was 351° West. That could change slowly in either direction. Hang in there, UT readers! Right now we have two of our best astrophotographers doing their best to give us an exclusive look! This page will be updated as more information becomes available. Partial Quote Source: Skymania News Release. We can only hope we look this pretty millions of years from now! This image shows what happens when galaxies interact, and how the gravitational forces distort and tear away at their original structure. Spiral galaxies can have their arms elongate out to enormous distances: in NGC 6872, the arms have been stretched out to span hundreds of thousands of light-years—many times further than the spiral arms of our own Milky Way galaxy. Over hundreds of millions of years, NGC 6872’s arms will fall back toward the central part of the galaxy, and the companion galaxy (IC 4970) will eventually be merged into NGC 6872. But that will be another pretty picture, as galaxy mergers often leads to a burst of new star formation. Already, the blue light of recently created star clusters dot the outer reaches of NGC 6872’s elongated arms. Dark fingers of dust and gas along the arms soak up the visible light. 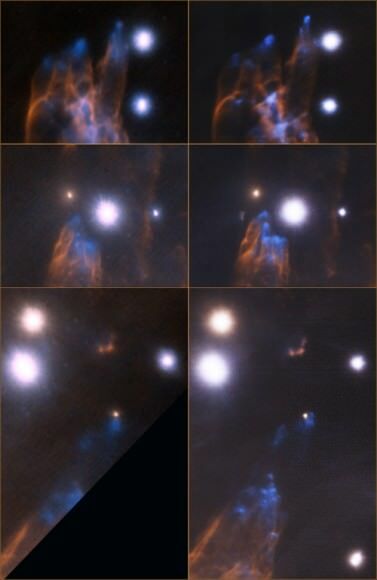 That dust and gas is the raw material out of which future generations of stars could be born. Members of the SGHS Astronomy Club Executive Council receiving the Gemini image on behalf of the entire club. Photo credit: Australian Gemini Office. Learn more about the contest and the winning team at this article on the Gemini website. Also, a new contest is underway for Australian students in 2011, and more details can be found at this link. Big planet or companion brown dwarf? Using the Hubble Space Telescope and the Gemini Observatory, astronomers have discovered an unusual object orbiting a brown dwarf, and its discovery could fuel additional debate about what exactly constitutes a planet. The object circles a nearby brown dwarf in the Taurus star-forming region with an orbit approximately 3.6 billion kilometers (2.25 billion miles) out, about the same as Saturn from our sun. The astronomers say it is the right size for a planet, but they believe the object formed in less than 1 million years — the approximate age of the brown dwarf — and much faster than the predicted time it takes to build planets according to conventional theories. Kamen Todorov of Penn State University and his team conducted a survey of 32 young brown dwarfs in the Taurus region. The object orbits the brown dwarf 2M J044144 and is about 5-10 times the mass of Jupiter. Brown dwarfs are objects that typically are tens of times the mass of Jupiter and are too small to sustain nuclear fusion to shine as stars do. While there has been a lot of discussion in the context of the Pluto debate over how small an object can be and still be called a planet, this new observation addresses the question at the other end of the size spectrum: How small can an object be and still be a brown dwarf rather than a planet? This new companion is within the range of masses observed for planets around stars, but again, the astronomers aren’t sure if it is a planet or a companion brown dwarf star. The answer is strongly connected to the mechanism by which the companion most likely formed. Dust in a circumstellar disk slowly agglomerates to form a rocky planet 10 times larger than Earth, which then accumulates a large gaseous envelope; a lump of gas in the disk quickly collapses to form an object the size of a gas giant planet; or, rather than forming in a disk, a companion forms directly from the collapse of the vast cloud of gas and dust in the same manner as a star (or brown dwarf). If the last scenario is correct, then this discovery demonstrates that planetary-mass bodies can be made through the same mechanism that builds stars. This is the likely solution because the companion is too young to have formed by the first scenario, which is very slow. The second mechanism occurs rapidly, but the disk around the central brown dwarf probably did not contain enough material to make an object with a mass of 5-10 Jupiter masses. 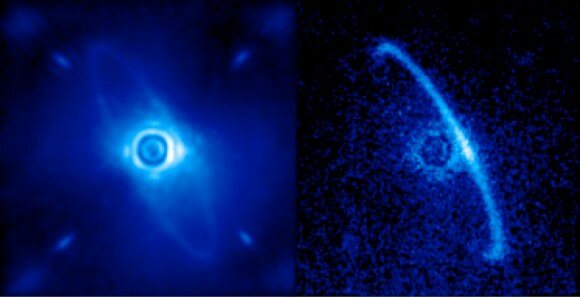 “The most interesting implication of this result is that it shows that the process that makes binary stars extends all the way down to planetary masses. So it appears that nature is able to make planetary-mass companions through two very different mechanisms,” said team member Kevin Luhman of the Center for Exoplanets and Habitable Worlds at Penn State University. If the mystery companion formed through cloud collapse and fragmentation, as stellar binary systems do, then it is not a planet by definition because planets build up inside disks. The mass of the companion is estimated by comparing its brightness to the luminosities predicted by theoretical evolutionary models for objects at various masses for an age of 1 million years. Further supporting evidence comes from the presence of a very nearby binary system that contains a small red star and a brown dwarf. Luhman thinks that all four objects may have formed in the same cloud collapse, making this in actuality a quadruple system. “The configuration closely resembles quadruple star systems, suggesting that all of its components formed like stars,” he said. The team’s research is being published in an upcoming issue of The Astrophysical Journal.